I woke up this morning, earlier than I would have liked, just as I was about to sign a deal on a very tatty looking Moto Guzzi Stelvio. Ever since I rode a Breva 750 around the car park the other day I've been utterly unable to stop thinking about that engine! It felt more alive than anything I've ever sat on even though it was less powerful than anything over a 250 that I've ever ridden. Suddenly, I can't help thinking how much I want that engine with a little more protection for those long winner rides and more upright ergonomics. Thus the Stelvio. And why not? Well actually that's a question most easily answered with bullet points. Unfortunately that's not an option in Blogger for Android. Here goes anyway. * Cost. They're not cheep. * I hear lead time on parts can be up to two weeks. * The parts department closes for August! * It's a little more engine than I want to own. It's probably not a good replacement for my Suzuki yet in my dream I happily threw caution to the wind, part exchanged my (fairly) trusty VStrom and signed a big credit agreement for the rest. Thinking with my brain, there's enough there to stop me doing something silly. 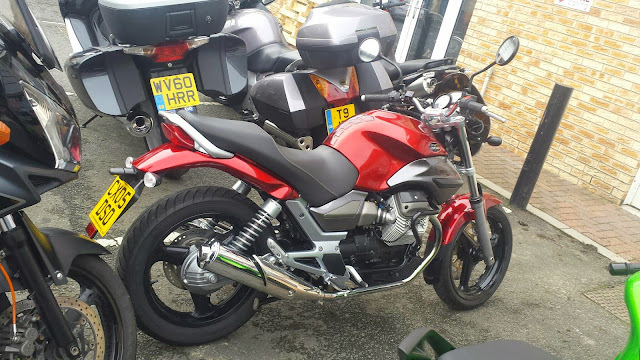 If Moto Guzzi took the engine out of a V7 and shoved it in an adventure styled bike I'm not sure I'd be able to help myself.